124 people like this listing. A Wow Factor Home!!! 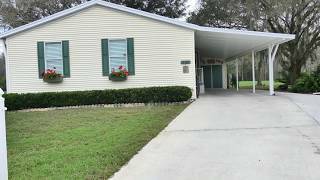 Located on a quiet cul-de-sac, this 2003 2 Bedroom/2 Bath Palm Harbor Home features just over 1400 Square Feet of living area which includes a beautiful Florida room. Situated on the Championship Golf Course, hole #14, the 12 x 18 screened lanai is where you can watch the wildlife or golfers from tee to green. This recently updated home features granite counter tops, stainless steel appliances, laminate wood flooring and completely renovated bathrooms. The large master bedroom will accommodate a king bed and features a large walk in closet. The guest bedroom has a Lazy-boy sofa with a queen size inflatable mattress for your guests. Home is being sold turn key. This home has added a link to their virtual tour.